It started in the parking lot at Home Depot late October 2014. Thoughts of bringing out a new creative side of me were dancing in my head. Sewing- check. Photography- check. Paper making- check. Gardening- check. Marathon running- check. I needed a new personal challenge. Something drew me to google “Art Classes” right then and there. Little did I know that I was sitting, buckled up and in parked position not a half mile from one of the most laid back and professional art studios in town. I scrolled the website and viewed the photos of middle-aged people (I’m almost there so “like me”) joyfully creating happy little trees. No seriously, I recognized an artist in one of the images. I have seen his work in the gallery at the JCC and have always admired his work. He is there? Am I worthy? Hmmm. Maybe this is too much. Maybe this is too high stakes and too high brow for my abilities. After all, I have never put brush to canvas. Wait a minute I tell myself. I am a master at paint-by-number ponies, dogs and cats from childhood! Doesn’t that qualify? I don’t think so. Shush up my negative side! Be quiet! Let the creativity flow without judgement. Isn’t being creative about being ME? If this new challenge is for me and not for others then who cares what others think, right? RIGHT! Pick up the phone. Make the call. What can it hurt? Whew, I am so glad I got the answering machine. That was easy-peasy-lemon-squeezy. I’m off the hook. They probably won’t ever return my call. You know those artist types. Brrrring… not 10 minutes later: “Hi, this is Judy from Schrodt Art Studio, you called asking about lessons?” Yep. Welcome to the newest chapter in life. It was Kismet, meant to be. Judy’s uncle died. Her Aunt was in a scramble to get a few of the Uncle’s personal items into a bag to take to the funeral home so they could start the preparation for the open casket viewing. The day of the viewing arrived and people were passing to pay their respects. The Aunt walked up for her turn and stated loudly, “So there’s where my sunglasses went!”. In the casket, in a restful positition, was Judy’s Uncle replete with the Aunt’s missing sunglasses which had fallen into the bag during the shuffle. ;-). The three hours passed in an instant while I was learning my new trade. What remains is the vision and warm emotion of the day. The camaraderie and openness that came from the group. About seven people, for around ten years, thrown together every Saturday morning over an easel. Bearing out surgeries, deaths, births and countless crazy funny stories about their lives. The small pear that I am trying to shape into well, a pear, is probably not why my soul guided me here. There is a greater purpose and I look forward to letting it unfold to me. In the meantime, I will keep going and painting and listening. Maybe I will create something worthy of the canvas and oil invested. I’m certainly getting full value for my time. 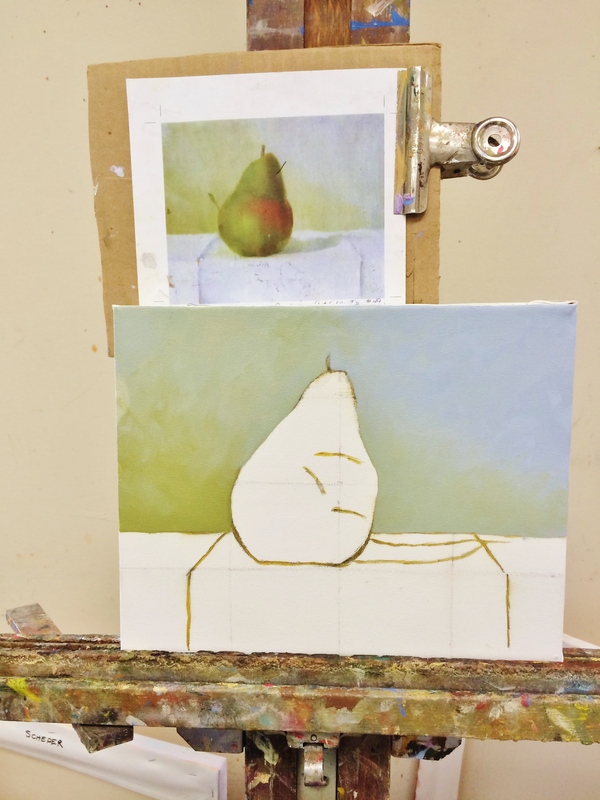 Hopefully this will resemble a pear in some way.